As wedding planners, over the years we have come across hundreds of real love stories and planned and executed weddings for many couples along the way. 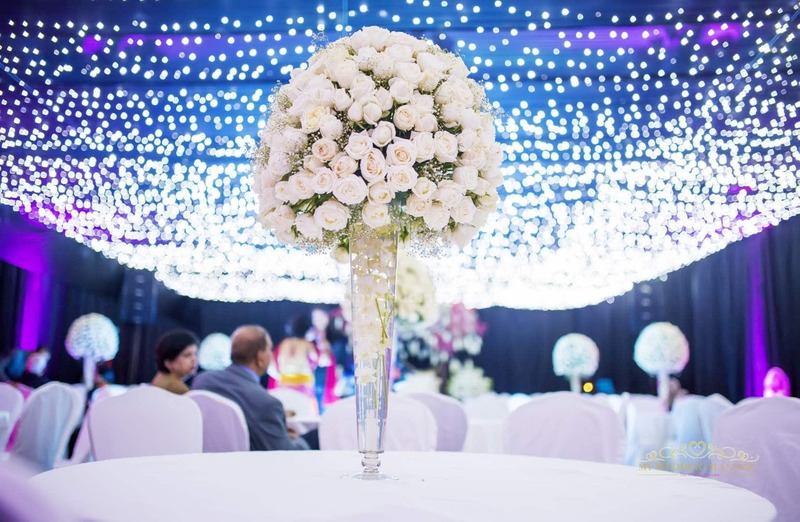 Soumya and Bryan’s wedding was one of the most beautiful weddings we at Elite Wedding Planner have planned in the six years since we formed our company. Our gorgeous couple Soumya and Bryan, were clearly besotted and meant for each other, and we knew their love story was going to be etched in our minds forever. One evening, we got a call from Soumya’s father saying he has seen our previous work and wanted a similar magical wedding for his daughter. The only problem was that Soumya was very simple and understated and didn’t really want a ‘big fat Indian wedding’! We took over the matter in our hands and convinced Soumya that her wedding would be earthy, natural, laid-back and fun in all the best ways possible And so the journey began. Soumya’s parents visited almost all Taj properties in the country including Faluknama Palace, Rambaug Jaipur and Umaid Bhawan. They even saw Jagmandir Island Palace and Zenana Mahal by the HRH group and Oberoi Udaivilas and Trident in Udaipur. 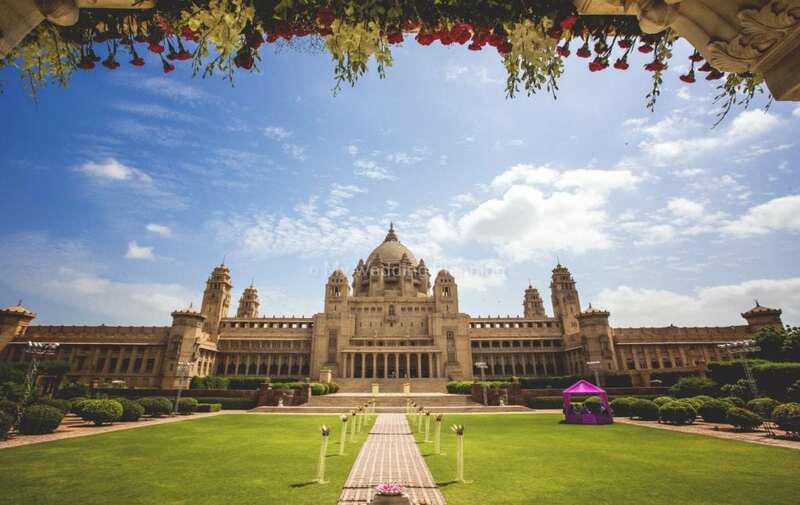 When they arrived at the Umaid Bhawan Palace, they could see that it had so much character that they immediately fell in love with it. The majestic Umaid Bhawan palace in their opinion was the grandest and most surreal of all the hotels they visited (no wonder, considering it has been rated as the world’s best hotel twice in a row by Conde Nast). They loved the royal ambience, the exclusivity and the extraordinary rooms that Umaid Bhawan had to offer. But most of all they fell for the imposing backdrop of the Palace against the wedding lawn. That was simply magical! Soumya was immediately convinced on seeing the resplendent Palace and they knew they had made the right decision. 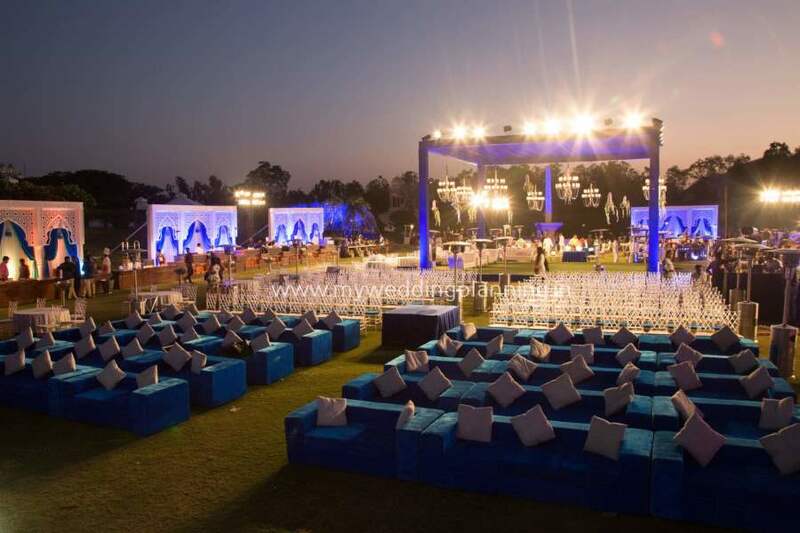 Umaid Bhawan was booked for the cultural night (pre wedding event), the wedding and the reception , while the Taj Hari Mahal in Jodhpur was booked for the mehendi by the pool. 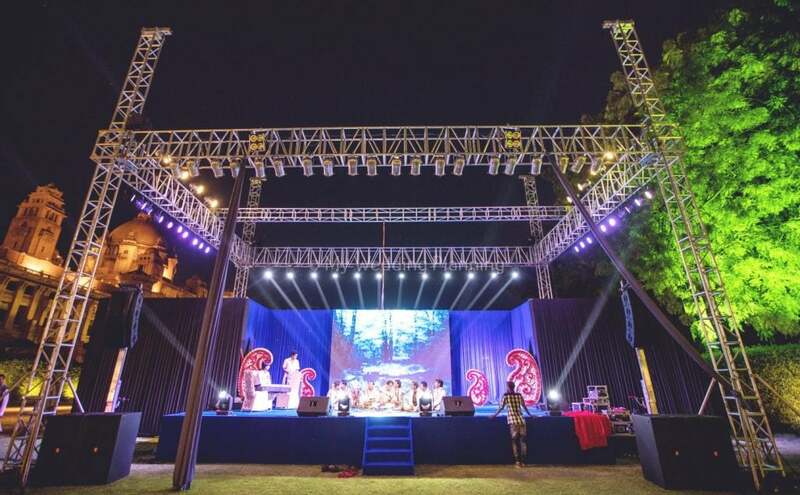 The outstanding Meherangarh fort was finalized as the sangeet venue. Soumya was a Tamilian bride and wanted to keep things as traditional and meaningful as possible. She wanted things to be different, interesting and interactive for her guests. She wanted colors for her mehendi. She loved richer maroons and golds for her sangeet with a royal Rajasthani touch. We as her wedding planners knew it was the small details that she would appreciate. While we incorporated colorful umbrellas and gota for her mela style mehendi; we opted for royal shamianas, shamadaans and crystals for her regal sangeet. The wedding had abundant flowers. 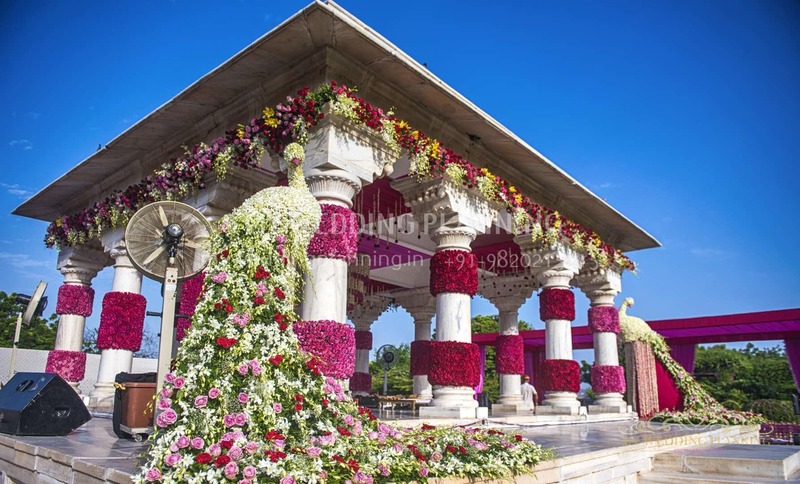 From gorgeous floral peacocks to floral hangings throughout her marble mandap, roses lilies and carnations filled up the space. The reception was a black tie event with fairy lights and tall table centerpieces. The highlight of the dinner was the Umaid Bhawan Palace that was lit up at night and looked absolutely surreal and stunning. We really wanted Soumya and Bryan’s wedding to reflect them as a couple and also to be able to incorporate our different ideas as well. We had a clear vision on the style we wanted to create for their wedding. We started by sending out decor mood boards of ideas we loved. We wanted to create a fun atmosphere at the mehendi where guests could just enjoy themselves. We created a center bridal enclosure to create a lounge feel. We also got a caricaturist to draw guests, and a photobooth for guests to take pictures. We gave out small mehendi gifts for the guests, as we wanted to make the wedding as memorable for them as possible with the entertainment, so we gave each of them a mix of bangles, mojris, ittar and dupattas. We wanted an informal food stall setting to cater to the ‘mela’. A lot of varieties of chats, kebabs, parathas and other street food was laid out on carts. This was a great hit for our guests. 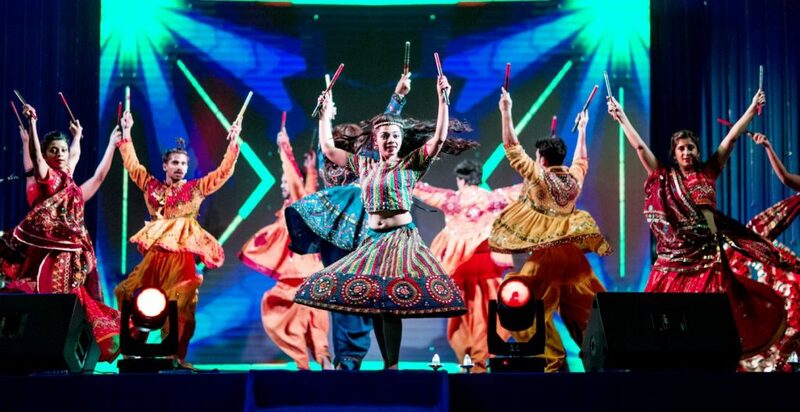 We wanted the first event to have a ‘welcome to Rajasthan’ feel. 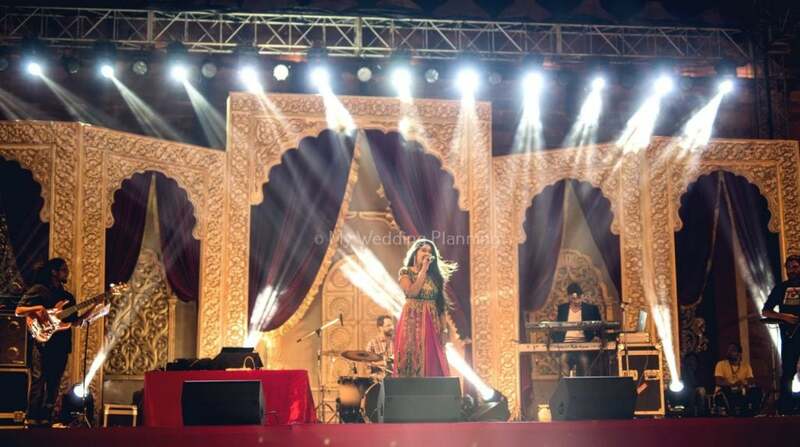 The sangeet was taking place at the Mehrangarh fort which has a long walk uphill. We placed Rajasthani folk artists all along the path for guests to experience as they slowly walk the hill upwards. 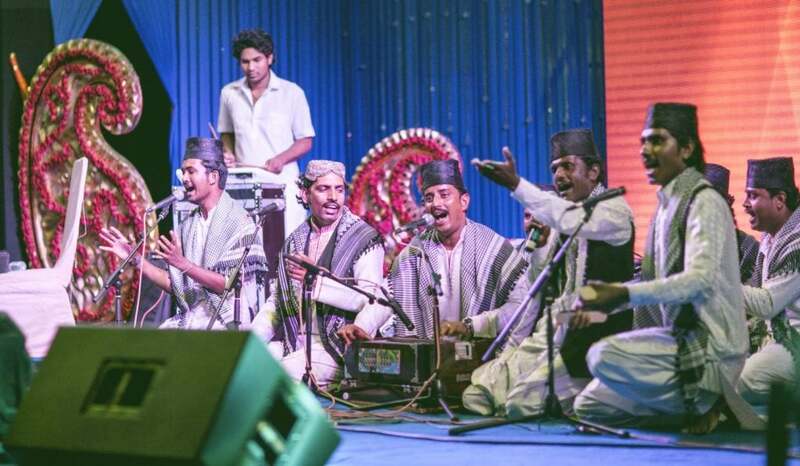 From kacchi ghodi, kalbelia dancers, ghoomar folk artists, langa singers to kathputli artists, rawanhatta performers and nagada players- we had it all interspersed in various places along the way. 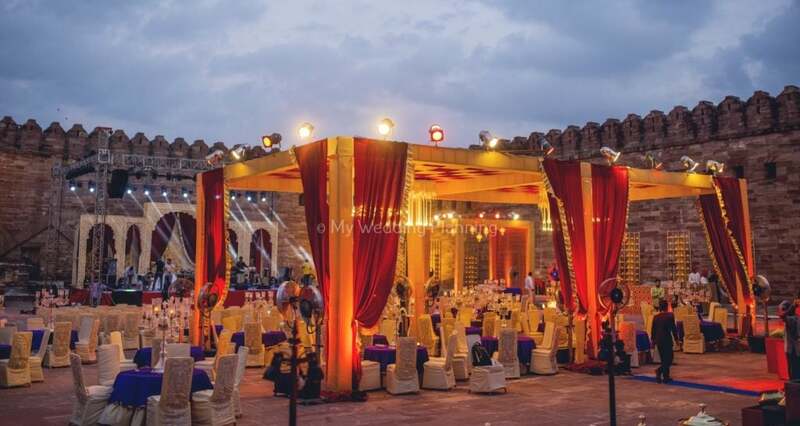 The Sangeet décor was traditional Rajasthani with modern colors like deep maroon. Lots of candles, illumination, hanging floral chandeliers, bulbs and crystals decorated the barren Mehrangarh terrace. Guests stopped for some champagne before they entered the sangeet area. Antara Mitra and Percussionist Hiten Panwar entertained guests as they danced the night away. Bryan is an American and Soumya is a Indian brought up in America. We wanted to introduce them to the heart of India. We thought of collaborating with Wooden Stage Dance Troupe from Mumbai to be able to showcase Soumya and Bryan’s love for one another using the backdrop of different dance forms of India. Wooden stage are masters at weaving fantasy with reality through their dance. They showcased dances from all over India, from Bhangra to Bollywood, while keeping the couple’s love story as the highlight. 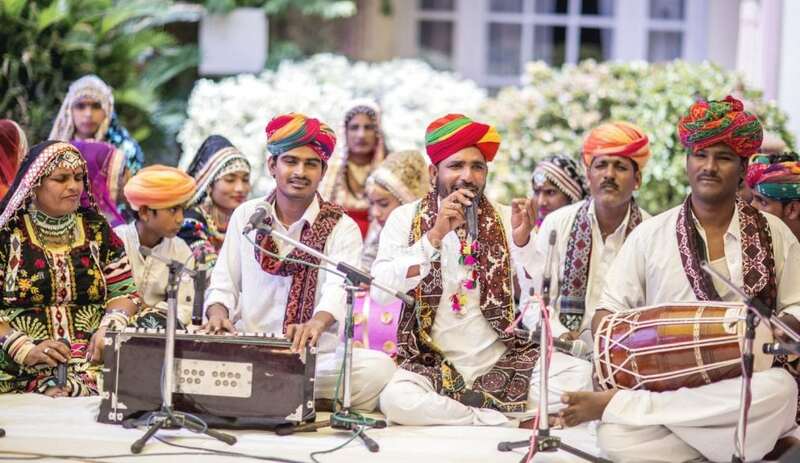 Later, this act was followed by a sufi night by the one and only Rajasthan Roots Sufi troupe. Umaid Bhawan has an existing gorgeous marble structure at their wedding venue. To match the greenery and the white marble, we incorporated a lot of colourful flowers. We wanted to keep most elements natural with burst of colour everywhere. The colours of the wedding were white, purple, red and pink with touches of yellow. Soumya entered in a floral curtain while Bryan came on an elephant. We wanted guests to understand the traditions being followed and gave out handouts describing each tradition one after the other. We wanted it to feel like an informal party, where family and friends could come together: smiling, making memories and dancing the night away. Umaid bhawan made a gorgeous all white six-tiered wedding cake. We kept a cherry blossom tree for people to leave love- notes and advice -notes for the couple. We had champagne served in customized glasses and had each table overflowing with flowers and candles. Seventy by Two Cinematographers put together a fantastic on the day edit film to highlight all the three days of festivities. Soumya dressed in the most stunning bridal ensemble from Manish Malhotra and Sabyasachi, while Bryan was super handsome in his Indian attire by Sabyasachi. 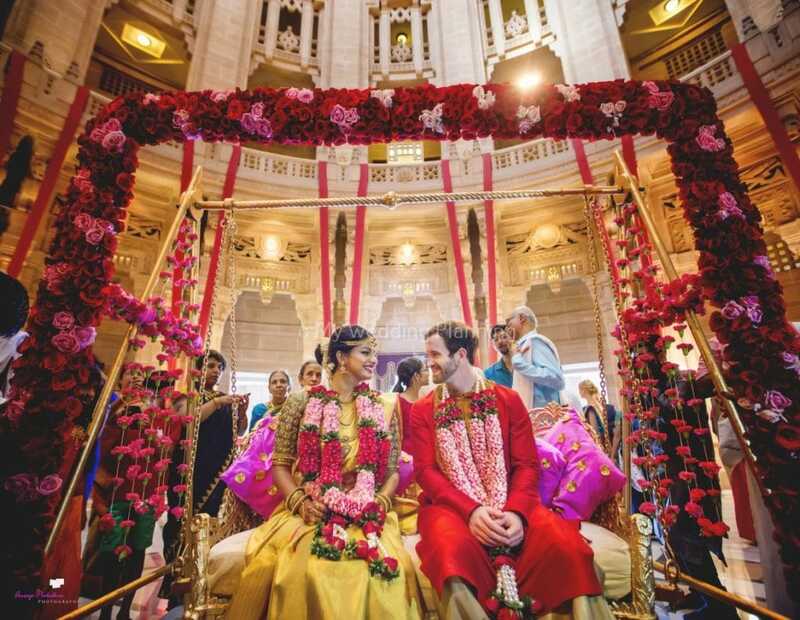 The two of them said their vows under a beautiful floral mandap, before a jazzy cocktail hour and an outdoor reception that went on all through the night, surrounded by family and friends from literally around the world. As if all of that wasn’t romantic enough on its own, Anoop Padalkar did a fabulous job with the photography, capturing all the joy and loveliness forever. Seventy By Two, another of our favourites made the wedding films. Umaid Bhawan’s menu had personalized, curated options of gourmet selections from all over the world and different parts of India. Mallika Jolly was selected as the make up artist and she did an amazing job. Décor was planned and executed by our in-house décor team with local support. 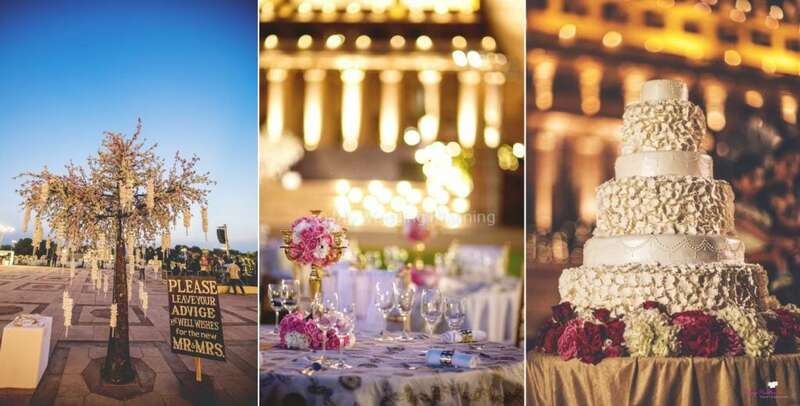 1) You’ve selected Umaid Bhawan- so your wedding has already all the makings of a fairytale. We would advise you to look into the weather as it can be very hot in most months (except October to February). 2) Make sure you stay in the Maharaja and Maharani suite- they are divine!! You will be taken care of like royalty. 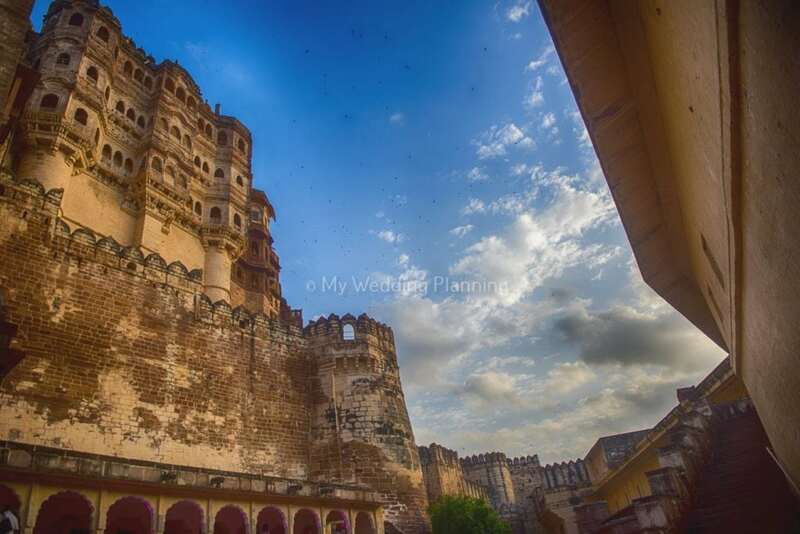 3) We would strongly advise taking up Mehrangarh fort for one of your functions- it is an amazing experience. 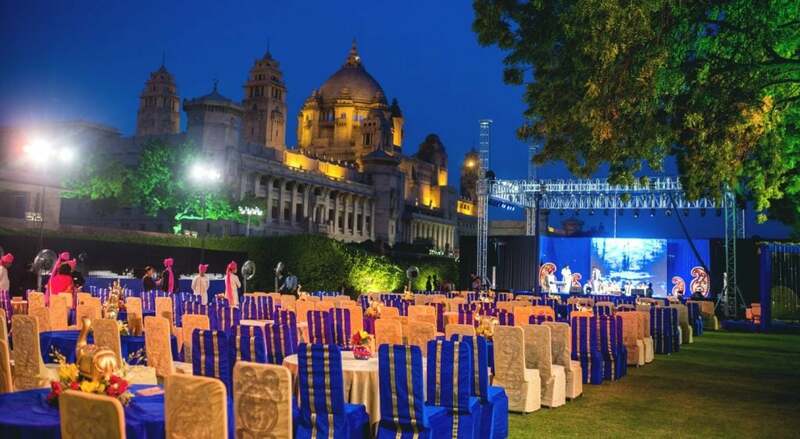 4) Have a night function at the main lawns with Umaid Bhawan as the backdrop. 5) Try to incorporate local vendors as well for entertainment , you will be surprised by how talented they are.